I learned last night that Jon Garland has been named Opening Day starter, and Chris Young the starter at Petco Opening Day 6 games later. Starting on Opening Day is an honor normally reserved for the best pitcher on the staff. This is why Jake Peavy made several Opening Day starts, why Chris Carpenter will start the Cardinals opener in Cincinnati, and so on. It gets a little tricky when a team opens the season on the road, as the Padres will do this year in Arizona, at least in my opinion. Teams don't want their home opener to be started by someone at the back of the rotation; and in some cases, teams will tweak their rotation so they get the guy they want starting the home opener. A good recent example is LA. Vincente Padilla will start the opener, and although he pitched very well down the stretch for the Dodgers last season, I don't think anyone would argue he's the best pitcher in that rotation. Clayton Kershaw will start the home opener at Dodger Stadium, and lots of people would argue he's the ace of that staff. So Jon Garland starting Opening Day on the road doesn't surprise or bother me. There's probably some politics in play with the selection; after all, Garland was the big free-agent pickup by this team over the winter, he started the 2009 season with Arizona, he's probably fired up to pitch against them. All well and good. However Chris Young's selection as the home opener starter was a surprise. Now, I like Young a lot as a pitcher, and have for a couple of years. Not to mention we have tickets to Opening Day, and he's my wife's favorite player, so getting to see him pitch is great. Plus, he's the 'old man' of the staff in terms of Padre service time, so perhaps he deserves this honor. However, he was hurt virtually all of last season, and when he did pitch he was ineffective due to injury. I thought Kevin Correia should have gotten this start. One of the reasons given for slotting Chris Young #2 in the rotation was to keep him from pitching in Coors. OK, that's fine, Coors isn't a great place to pitch, and Chris hasn't enjoyed all of his starts there (3-3, 5.31 career in 8 Denver starts). However if he was the #3 starter he still wouldn't pitch there next week. It is a fine point, and over a 162-game schedule doesn't matter much, but I find it curious. In other news, it appears Clayton Richard nailed down the #4 slot, and there's still been no official announcement as to who the #5 starter will be. With Tim Stauffer and Sean Gallagher apparently headed to the bullpen (and Joe Thatcher to the DL), we can reasonably narrow the competition down to two: Wade LeBlanc and Mat Latos. Both have pitched spectacularly during the spring, so either choice will be a good one. The SD U-T put up a story yesterday projecting the final 25-man roster. It can be found here. I don't have any real issues with Bill Center's projected roster. I know Matt Antonelli returned from the dead only this spring (after two years in hitter's exile), but I cannot help but wonder if David Eckstein's days starting at second are numbered. If Antonelli continues to tear it up in AAA, like he has in spring training, how long will the club let him languish at Portland? Especially if Eckstein continues to struggle at the plate (.260/.323/.334). Quick programming note: I will moderate a Padres Pre-season forum during the next Podcast (10 pm PDT Thursday). I will announce the confirmed list of Padre blogger participants tomorrow, stay tuned. Had a great discussion with Matt Smith of Feeling Dodger Blue last night on the Podcast. In case you missed it, here's a link to the recording. I'm working to get these files available via iTunes, so you can download it directly to your iPod/iTouch/iPhone of choice and listen in. - Kershaw is primed for a breakout season. We also talked a little Padres (Will Venable in the OF, the Kouzmanoff trade, Adrian Gonzalez trade rumors and where he's probably going to go). We also had some great questions from the Chat Room (hat tip to Coffey_77 who logged in), so it made for a very pleasant hour of baseball talk. One of the great things about the Baseball Bloggers Alliance is the opportunity to talk baseball with fans from across the country. Matt and I had never spoken to each other until last night, but with baseball as a common reference point it didn't matter. You often hear about fathers and sons who don't understand each other at all - generational gap and what not - but they share a common team rooting interest, which gives them something to talk about, and makes family gatherings much less awkward. It's true for strangers as well. Give two people something in common like baseball (or football, hockey, or basketball for that matter) and things just flow. Even if they don't share a rooting interest in the same team. Not much going on today, as I'm still recovering from last night's epic Xavier/Kansas State game. Corey Brock is reporting via Twitter Latos has a "cranky" right elbow, and will not start tomorrow, however Bud Black doesn't seem too alarmed at this development. So with that, enjoy the last weekend of Spring Training. The Padres break camp Wednesday. Before we get going, a quick announcement. Tonight is the weekly Padres Trail Podcast (10pm Pacific, here's the link), and I will be talking a little NL West baseball with Matt from Feeling Dodger Blue. Hope you can join us. Obviously I haven't been able to post as much as I like to for a couple of weeks, for a variety of reasons I won't go in to here. It seems the biggest news, other than Dwight Gooden being pulled over for driving under the influence, is Joe Mauer's 8 year, $184 million dollar contract. That contract has implications for all high end players (read: Albert Pujols), but it really goes beyond that. Minnesota is a small market franchise; if they can spend that kind of money on a marquee player it puts pressure on other small market franchises to do the same for their marquee players. Which brings us to Adrian Gonzalez. Gonzo has a lot of similarities with Mauer - hometown guy, best player on the team, cornerstone in the lineup, plus defender on the field. There are some significant differences, though. Mauer plays a more demanding position than Gonzo does. Mauer's won an MVP and 3 batting titles; Gonzo led the NL in walks last season and hasn't finished higher than 12th in the MVP voting. Gonzo thinks he's worth $18-20 million a year. Is that reasonable? Two graphs for your consideration are presented below. 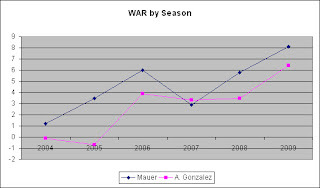 The first is Gonzo's WAR as compared with Mauer, the second their games played. Gonzo's been more durable, but Mauer has been significantly more valuable as a player. The year Gonzo graded out better in WAR he played 52 more games (or 30% more) but only had a 0.4 better WAR score (or about 12%). Mauer's better than Gonzo, at least historically going into this season. So with that background, here's something to chew on. 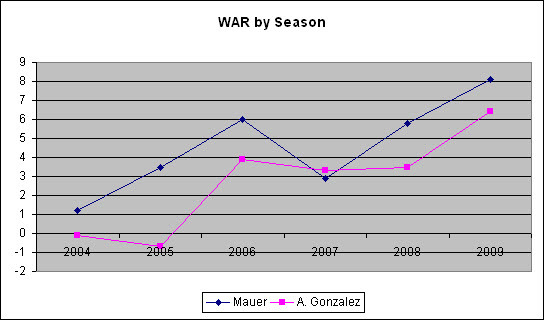 Looking at their 3 highest WAR seasons, Mauer averages 6.63 WAR per year, Gonzalez 4.6. Using Mauer's $23 million per year contract, Mauer's getting paid about $3.46 million per historical WAR. Setting that as the metric, Gonzo would be worth $15.95 million max. There is no true statistical rigor to that above paragraph. I know Mauer's 2009 season was 35% better than his previous high WAR season (Gonzo's, by comparison, was 64% better), so including 2009 skews the average high. Contracts are written based on what teams believe a player's future contribution will be, not based solely on what they've done so far (at least, that's how I would approach negotiations). However, I do think it's fair to say Mauer's contract could drive Gonzo's market value down. No one's going to pay Adrian Gonzalez $20 million a season now that Mauer's signed for $23 mil - he's just not worth that much. For the first time there might be a small glimmer the Padres can keep Adrian Gonzalez in the fold. - I moved tonight's Podcast to 7pm Pacific, because I expected to be in Charleston SC tonight. - The event I was attending ends early, so I'm headed home. - The internet connectivity in my hotel is remarkably slow - so slow I can't get to Blog Talk Radio from my room to change the time back to 10pm Pacific. - The internet connectivity at the meeting site won't let BTR load, so I can't get there from here either. So, tonight's Podcast is cancelled. See you next week. (note this also explains why there hasn't been a post this week). Had a chance to hear the last three innings today (Padres win 9-3) on the drive home. The Padres got one run in the top of the seventh, but other than that the game was mostly uneventful. That's not going to stop me from putting up some comments, though. With Luis Durango on second base and two out, Seattle pitcher Fields bounced a pitch to Chad Huffman. Durango promptly took off for third and made it safely. The way Leitner described it, that pitch didn't get very far from the catcher. It almost sounded like Seattle catcher made a play on the ball rather quickly. Durango is ridiculously fast, but how fast? I would have liked to see the video of that play. Tony Gwynn Jr made a great diving catch in the bottom of the frame, to which Jerry Coleman said, "That's the best catch of the year so far". Of course this year, at that point, was 16 innings old. I'm going to miss Jerry. Aaron Poreda: 2 IP, 1 walk, 3 strikeouts. The walk was a 4-pitch one, and after he missed way high to start the next hitter his catcher went out and calmed him down. He then proceeded to strike out the final hitter in the seventh. Nice. Ted Leitner described the Mariners as the best pitching team in the AL last year based on ERA. This is true, they were the only team in the AL with an ERA under 4.00 (3.87 to be exact). Their FIP was 4.39, however, good enough for 9th. The Mariners had the highest differential between FIP and ERA, meaning their pitchers benefited from superior defense behind them. Ol' Ted then went on to say the Mariners wouldn't be good this season unless they improved their defense, because they had the third most errors and fourth lowest fielding percentage in the AL. Ted, Ted, Ted. I love listening to Ted, I think he calls a great game, but he needs to join the 21st century when providing color analysis. Seattle had so many errors on defense because they got to so many more balls than anyone else. Seattle, based on UZR, had the best defense in the MAJORS in 2009, and it wasn't particularly close. This is why they won 10 more games than their runs scored said they should have won. I had this great idea to do a post comparing wOBA values for Adrian Gonzalez and Teixeira. Dave Cameron beat me to it. Sigh. However, you should read that article anyway. or practically even. Teixeira is considered an above average defensive first baseman. Gonzalez has won the Gold Glove two years in a row, solidifying his reputation as an above average defensive first baseman. Cameron makes the point that Gonzalez probably won't get a Teixeira-sized contract, if only because the Yankees aren't going to be vying for his services in two years. They have some guy named Teixeira, and he's signed for another 4 years beyond 2011. That may very well be true. At issue, however, is how much Gonzalez is worth on the open market - and based on the comparisons to Mark Teixeira, I'd say Gonzo's estimate of $20 million per year is right, as is his agent's estimate of $18 mil per season. If the Padres were unable or unwilling to honor the balance of Jake Peavy's contract (2011 - $16M, 2012 - $17M, 2013 - $22M w/ a club buyout option), why would we expect them to turn around now and offer the exact same money to Adrian Gonzalez? Even with a new ownership group, the financial straits of the team are probably the same as they were 12 months ago, one that won't support a large contract like that. The big news today is Adrian Gonzalez's statement on what he thinks he's worth (Mark Texieria-sized money). More on that later in the week. Thanks to Liese Doherty at the USNI for her assistance in making this post possible.